Stanford Scientists have discovered that as humans migrated into regions with a colder climate, a single-letter DNA switch, from a G to an A, helped humans tolerate frigid temperatures. 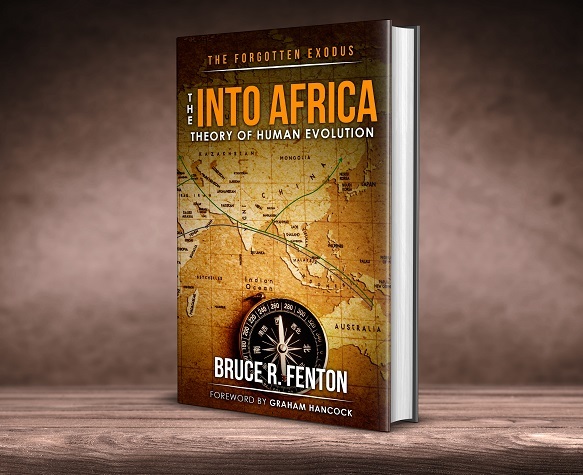 A deeper analysis of the Stanford University research data suggests that this happened first in Australasia – not during an Out of Africa migration as claimed by the researchers. [This article explores the conclusions reached in a new study, and offers the opinion of this writer as to the possible interpretations of some of the associated scientific findings]. In a paper published on July 3rd in the journal Nature Genetics, Terence Capellini, an associate professor of human evolutionary biology, revealed that a genetic “switch” had changed the functionality of an essential skeletal gene that affects bone growth and height. Specifically, the switch leads to shorter and stockier build, and somewhat surprisingly (for the research scientists) it is far more prevalent among Eurasian populations than it is among Africans. The project was initially looking to understand better the genetics involved in height variation, the link between their target gene GDF5 and the DNA switch was all something of an accidental discovery. The researchers were also left to ponder why the change, that carried with it increased risks of osteoarthritis, would be favoured by the evolutionary process. There is little need to repeat here material that can be seen on a dozen other related news stories, most of which offer lengthy speculations on why decreased height might have been beneficial to humans moving into colder climates. The press release from the Stanford team is well-explained by journalists writing for both Harvard News and the Telegraph, should anyone wish to read more on it. The source paper itself is very dry for lay readers, and unless a reader happens to be a molecular biologist or are involved with researching possible gene therapies for osteoarthritis, it is likely they will want to skip over it. The academic paper does contain some fascinating insights for anyone that shares an interest in the temporal and geographic origins of modern human populations. Additional aspects of the tests involved in the project showed that the Derived allele A variant of the switch favouring shorter height is most prevalent among European and Asian populations, almost half of these peoples carry it, it is rare among African populations. In the coverage offered by The Stanford Daily, the reporters state that the switch event occurred during an Out of Africa migration around 60,000 years ago, but two major data points do not support this assertion. The first point that must be acknowledged is that modern humans were already in Australasia at least 65,000 years ago, increasing physical evidence points towards a minimum date of 80,000 years of occupation (Arnhem Land, Port Richie and Lake George). The second key data point is that Sub-Saharan Africans have almost no incidence of the DNA switch, making them a poor source population, while half of all Eurasian people today do evidence the genetic change, even Neanderthals and Denisovans shared it with fully modern humans. Neanderthal and Denisovan populations were prominently in East and Southeast Asia. 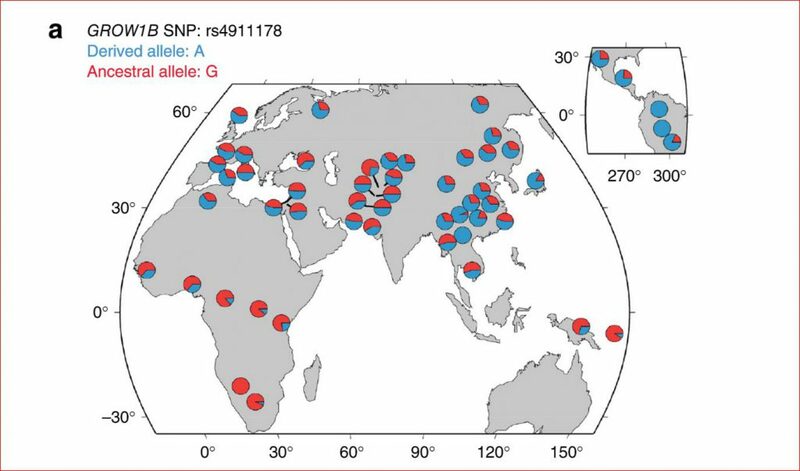 Denisovan DNA is only found today in the genome of one single living human population, Australasians, making it most likely their homeland was on that continental plate. Unlike Sub-Saharan Africans, who tend only to carry the less afflictive form of the gene (ancestral allele G) the most ancient non-African population on Earth has a significant representation of the derived allele A. The most logical deduction is that derived allele A emerged among Australasians while moving into the colder southern and interior regions of their continent, thousands of years before the colonisation of East Asia began. In this scenario, the first migrants into Asia would have been made up disproportionately of people carrying the switched DNA, perhaps a tribal group that had moved up from a colder southern interior region before exiting the continent. The distribution map provided by the research team fits best with migration events in which the switched for of the allele initially moved into East Asia, before then spreading westward. During the migrations to the west, this form of the allele was then gradually selected against, and gracile morphology became more common (tall, slim build). This picture emerging from the data matches our living reality today. Perhaps the Australian interior was the only place on Earth where the arthritis associated genetic changes were significantly beneficial. The GDF5 research offers us yet another piece of genetic data that compels us to look at Australasia as the potential source of the human migrations into Eurasia 60,000 years ago. 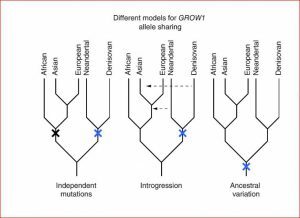 When we consider the genetic data from Neanderthals and Denisovans, that they share the derived allele A with modern Asian humans, we are also drawn to think that all three lineages share the same deep Australasian origin.